Despite the destruction of war and the ravages of time, the Breidenbacher moniker was resurrected last decade as the namesake for the third installation of the twice-rebuilt luxury accommodation in Düsseldorf’s well-to-do Königsallee district (a.k.a. ‘The Kö’). A natural choice for the brand given the hotelier, Wilhelm Breidenbach, and his legacy: one characterized by a penchant for entertaining high society while giving them something special to write home about. The modern day hotel, situated upon the same foundations as Wilhelm's premier address, is idylically placed in the heart of the Königsallee neighbourhood. Between Düsseldorf's Alt Stadt (old town) and central connectivity hubs, it presents as a sort of unofficial welcome mat for the vibrant city it calls home. For some weary travelers, it's an oasis - one they return to week after week - for a quality stay they've come to know and depend on. Once you visit - you'll know why. A step through the Breidenbacher Hof's traditional brass-clad doors will quickly reveal just how seriously the hotel takes its proximity to the Kö. At Christmas, this translates to a mountain of totes sporting Gucci, Givenchy, and Bulgari brands, each illuminated by a host of nearby twinkling lights and bauble-filled-centrepieces. During fashion week in Spring, one can only presume that an equally eye-catching testament to its stylish location will be on display. But no matter the time of year, sashay up the lavish staircase from the main lobby and to the second floor. Once there, you're bound to discover one of the city’s finest contemporary destination for foodie-indulgencies. 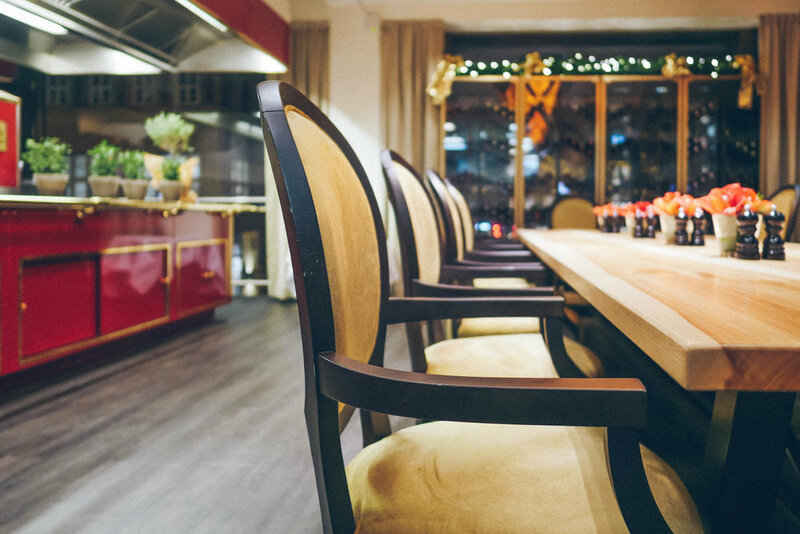 The Brasserie "1806" is known for serving true-to-tradition French-inspired cuisine all year round for ambitious travelers and craving-ladened locals alike. Start with a glass of champagne in hand – pre-amuse-bouche - and you'll find that it's tempting to take your time, watch the world through the window go by in the street below, and get cozy. But, barely a flute of fizzy in - it shan't take long before tiered trays, bread baskets, and champagne-filled ice buckets catch your eye. So much for people watching - Let's eat! Being a brasserie, this restaurant is clever with how it incorporates seafood into the menu which is atypical for this city. Just imagine savoring a subtle lobster cream bisque pre-meal or an equally delicate (and surprisingly addictive) tuna-steak tartar as a starter. Omnomnom. But the appetisers are only the begining! For mains, there's a mix of local-inspired Düsseldorfer dishes as well as brasserie-type-fare: each paying homage to their culinary and cultural roots while baring the marks of modern gastronomic experimentation and plating. In this grain, the desserts are a particular show stopper (see below). The color palette and the balance of sweet-and-refreshing notes are brilliant. As for the icing on the cake? On our recent visit to Brasserie "1806" that came in the form of a personal tour through Executive Chef Philipp Ferber's self-designed show kitchen. Sporting a boisterous red cladding, the Molteni-made gear is the stuff of dreams for most culinary masters. For the select few, private parties may be arranged with Chef Philipp at the helm at Brasserie "1806". On other special occasions, his show kitchen opens its doors to those in the know - attendees to some of the hotel's most-celebrated foodie events. To discover more of this top-Düsseldorf restaurant, click through the gallery images below. Hungry? More details here.